I have a Nexus 4 with Android 4.3 and I am trying to connect the device to a computer with Windows 7 64bit. What can be the reason for this error? At some point, the device should show up a messagebox to ask you if you authorize the computer. After you click yes, the device is then authorized and the connection is hooked. I made sure Eclipse and android device monitor weren't running. After adb was restarted, I got a prompt on my device to authorize which I allowed. Сhange USB connection mode from MTP to Camera (for Nexus 7) or, possibly, to Mass Storage or something else (for other devices). This option is usually under Settings -> Storage. Then connect the device again, you'll get the authorization dialog. MTP has been known to interfere with USB debugging -- these two did not work together at all on majority of older devices. Nexus 7 and many newer devices do allow both to work alongside, but this particular issue suggests it's not all that smooth yet. I think it has an error when the device tries to display the screen asking for permission, so it does not appear. start adbd (restart adb with new keys). 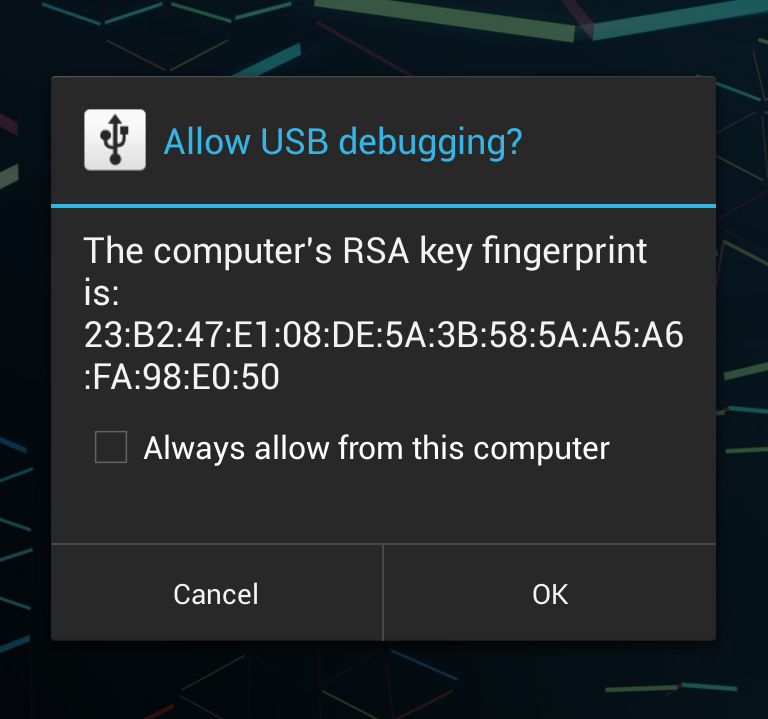 After you ensure you have enabled USB debugging unlock your phone and plug it into your machine via USB. You will be then asked to authorize communication with the computer you have connected to. It will also show computers RSA key fingerprint. Accept it and you are good to go! 2.) Run command "adb kill-server"
3.) Run command "adb start-server"
You should now be prompted to accept debug key. Similar to Flavio's answer (https://stackoverflow.com/a/18542792/1064996), it was something to do with the files in ~/.android (on the host machine, not the phone). I didn't have ~/.android/adbkey, but I did have ~/.android/debug.keystore and my whole ~/.android directory was owned by root. I removed the keystore file and also changed ownership to me (sudo chown -R $USER ~/.android), killed the adb server and plugged in my phone, and it worked. 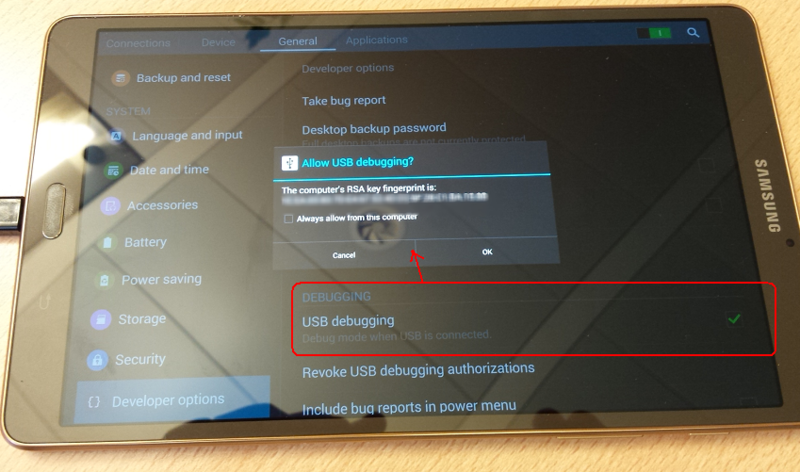 For my Samsung S3, I had to go into Developer Options on the phone, untick the "USB debugging" checkbox, then re-tick it. Then the dialog will appear, asking if you want to allow USB Debugging. Once I'd done this, the "adb devices" command no longer showed "unauthorized" as my device name. Updated the driver in device manager, however enable/disable USB debugging and unplugging/plugging USB still did not work. Finally the "adb kill-server" and "adb start-server" mentioned in other answers did the trick once the driver was updated. Reboot your phone into recovery mode. Connect it to your computer. All done! Just adb shell reboot and feel the power! I reinstalled the usb drivers and ensured that I was not using USB 3.0 port. I then closed out eclipse and killed and restarted adb. Was immediately prompted on phone to allow computer access. After accepting I restarted eclipse and now my Galaxy S3 shows up in device Device Manager. If you are on adb over network, try to connect via USB instead or vice versa. This did the trick for me. After accepting it once it always works later on. This kind of an old post and in most cases I think the answer that has been upvoted the most will work for people. In Lollipop on a GPE HTC M8 I was still having problems. The below steps worked for me. Now you should get the RSA popup on your phone. stop all adb processes "killall adb" in linuxoids and "taskkill /IM adb.exe" in windows or simply the taskmanager in both. I had to re-install my adb driver to snap out of this probelm. I had install "Universal Naked Driver" in an effort to recover my phone. I uninstalled that and re-installed the driver out of the android sdk. When I turn off my Comodo Antivirus everything goes back normal. All other solutions suggested here went in vain. Somehow I figured out one solution. If you are using Comodo Antivirus (Version 6.3/ For other versions search for similar options) the following solution would help you. Uncheck this "Filter loopback traffic" option, which prevents adb from normal working. Use a different USB cable. Some cables may not have all pins connected or whatnot, and while they work for image transfer, the debugging/adb does not work. The bottom line: I kid you not. A cable which works for my phone (adb works) does NOT work for my tablet - the device is always offline or unauthorized and tablet pops out no dialog. I tried multiple reboots, settings, I went berserk in the process and cursed the bloody Android. Then accidentally I plugged in the cable which came with the tablet and suddenly it worked. My fascination with Android is definitely gone. What a stupid piece of junk. It happened for me after my backup software changed the permission to my user directory. I opened it in File Explorer, it prompted me to set permissions and it fixed the issue. FYI: Android has a special directory under "\User\.android" If you can't access it, it won't prompt you. I then saw the device listed as unauthorized, unplugges the USB, plugged back in and was prompted for the RSA fingerprint. I was facing same, issue, I found I was using a simple usb cable which was meant for only charge and not data copy. using good usb cable solved my problem ! Simply re-plugging did the trick for me.... The permissions-dialog didn't show up the first time I plugged in the device, the second time it did and everything is fine now. Not the answer you're looking for? Browse other questions tagged android authorization adb nexus-4 android-4.2-jelly-bean or ask your own question. Why does adb return offline after the device string? What are the Android SDK build-tools, platform-tools and tools? And which version should be used?